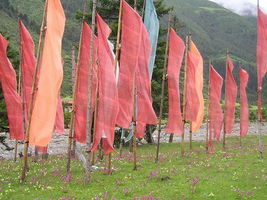 2 Tenzin breathed a prayer of thankfulness as he watched the colored prayer flags snap in the icy wind. He had spent five hours climbing through a jagged mountain pass called the Nangpa La Pass. His boots had holes in them. Snow crunched in between his bare toes. His eyes were swollen from the wind. In spite of his discomfort, Tenzin felt so happy that he had finally reached Nepal. 3 Tenzin and 15 other Tibetan Buddhist monks had made a 650-kilometer trek across the rugged Himalayan Mountains. They traveled with their paid guide, Dorje. It was the only way that they could safely travel from Tibet to Nepal. Their goal was to be able to have religious freedom. They wanted to eventually go to India. Their political and spiritual leader, the Dalai Lama, had lived there since the Chinese Communist takeover of Tibet. 4 Tenzin's journey began when he tossed his backpack into the back of a truck in Lhasa, the capital of Tibet. He said goodbye to his monastery. He said goodbye to his favorite statue of Buddha. He jumped into the back of the truck with his fellow monks. They endured a bumpy ride as the truck drove along a winding dirt road. They watched the red Chinese flags and the crumbling monasteries of Lhasa fade in the distance. 5 The most frightening part of the journey was when they passed Chinese checkpoints on the road. Before each checkpoint, they had to jump out of the truck. They crept through a ditch as the truck drove down the road. Then, they jumped back into the truck after it passed the checkpoint. It was a nerve-wracking way to travel. Tenzin had faith that this time he would make it safely out of Tibet. Tenzin had tried to escape six years ago when he was 22. He had to turn back because one of his companions became sick. This time, he did not want to turn back. He told his guide, "I would rather die than return to Lhasa." 1. Tibetans used the rare snow lion on their national flag. Pick a country that you would like to visit. Research exotic animals from that country and design a new flag for that country. Write a short description of why that animal would be a good symbol for that country. Or, make up an imaginary country and use an imaginary animal for your flag. 2. Imagine that you own a shoe store and that a barefoot Tibetan monk comes in wanting to purchase his first pair of western shoes. Write a dialog between you and the monk describing different kinds of shoes and his response to them. Write about which shoes he selects, and why. 3. 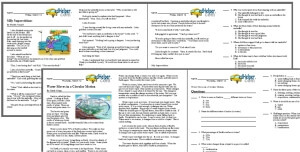 Design a travel brochure for Tibet. Include descriptions of at least one natural wonder and one cultural landmark in Tibet. If necessary, do further research to make your brochure interesting and factual.